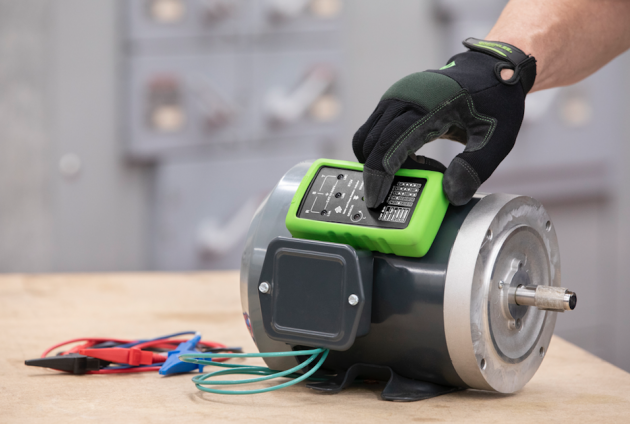 Emerson has introduced the new Greenlee Phase Sequence and Motor Rotation Indicator (5124). Backed by a manufacturer’s lifetime limited warranty, electrical contractors, HVAC/IR and industrial maintenance technicians can use one device to identify motor rotation direction and clockwise or counterclockwise wiring configuration in a three-phase power source — safeguarding to ensure proper installation. The Phase Sequence and Motor Rotation Indicator is now available. The new Phase Sequence and Motor Rotation Indicator is rated CAT III 600V and is CE, CETLUS certified. The phase sequence indicators illuminate when three phase power is detected and phase sequence orientation for three-phase power sources and industrial equipment is identified. A non-contact motor rotation feature determines the rotation of a running single-phase or three-phase motor and illuminates clockwise or counterclockwise motor rotation LED indicators to detect incorrect wiring and help prevent damage to industrial equipment. The new Phase Sequence and Motor Rotation Indicator features tri-coloured banana leads, alligator clips, soft carrying case and a durable over molded holster protecting the meter from debris and damage. Visit Greenlee.com/MotorPhaseIndicator to review the Phase Sequence and Motor Rotation Indicator’s technical specifications.